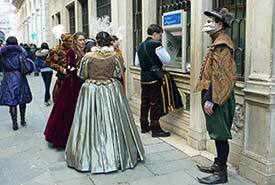 ABOVE: Venice Carnival participants get cash from a bancomat near the Piazza San Marco. Are ATMs easy to find in Venice? Yes. Just look for the nearest bank. Nearly all Venice banks have 24-hour "bancomats" (automated teller machines or cashpoints) facing the street. Most bank ATMs are available to tourists and have multilingual menus. However, bancomats at Venice's largest savings bank--the Cassa di Risparmio di Venezia--are reserved for customer transactions. A few ATMs may have withdrawal limits. If you're attempting to withdraw more than, say, 250 euros and the bancomat won't complete the transaction, try again with a smaller amount. International ATM network connections aren't 100 percent reliable. Always carry enough cash to meet your needs if the network is down for repairs or maintenance. It's always a good idea to notify your bank and credit-card companies before traveling abroad. Otherwise, you could find that your cards are blocked overseas. For more advice and warnings, see our Money and Currency article. You'll find money-exchange counters at the airport and in major tourist areas. However, you're likely to save money by your ATM card to get euros from Bancomat machines. Do you have any advice on tipping? Tipping is tricky, because customs and expectations vary by nationality. For example, Australians often hate to tip, while Americans tend to tip more generously than Europeans do because the U.S. service economy is built around tipping. Hotel porters. Tip 1 to 2 per euros per bag, depending on the hotel category. Bartenders. Tipping is optional in bars and cafés. If you're seated at a table, you can tip the waiter or waitress as you would in a restaurant; if you're standing at a counter, you can give a modest tip to the bartender or barista (for example, when handing over your ticket for a drink or coffee in traditional Italian bars where you prepay at the cashier's desk). Taxis. In land taxis, it never hurts to round up the bill when paying. In water taxis, there's no need to tip unless the driver has performed a special service. Toilets. In nicer restaurants or other places where lavatories have attendants, it's normal to leave 50 cents or a euro on the attendant's plate. In public WCs that charge fees (see our Venice Public Toilets article), there's no need to tip. Our advice: Don't feel that you have to tip generously (Italians aren't big tippers), but don't feel guilty about overtipping, either. Service employees aren't likely to be offended by your largesse.